Fig. 190 Heart, cardiac cycle . 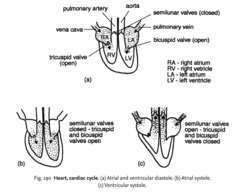 (a) Atrial and ventricular diastole. (b) Atrial systole. (c) Ventricular systole. the muscular contractions that squeeze blood through the chambers of the heart and around the blood circulatory system. The return of blood into the heart differs in ARTHROPODS from the mechanism in all other groups. In arthropods blood is drawn into the heart from the pericardial cavity by a sucking motion. In other animals blood flow into the heart depends on venous pressure being higher than in the relaxed heart, thus pushing blood inwards. CARDIAC MUSCLE has a rhythmic beat which arises in the heart itself. MYOGENIC CONTRACTION occurs at about 72 beats per minute in man, although the rate is higher in smaller mammals. The rate is regulated by two nerves connected to the SAN. Sympathetic nerves from the spinal cord accelerate the heartbeat, while the vagus nerve from the brain medulla slows it down. when the heart is relaxed (the diastole phase) pressure from the venae cavae and pulmonary veins causes blood to enter the atria and, to a lesser extent, the ventricles. Once full of blood, a wave of electrical energy, originating in the SAN, spreads across the atria causing a sharp muscular contraction, or systole which forces blood into the relaxed ventricles. the electrical energy from the atria collects in the AVN and then spreads over the ventricular walls via the bundle of His and Purkinje fibres, causing ventricular systole starting at the base or apex of the heart. Meanwhile, the atria are starting diastole ready to receive further blood from the veins. These changes are illustrated in Fig. 190 which shows a simplified heart structure.